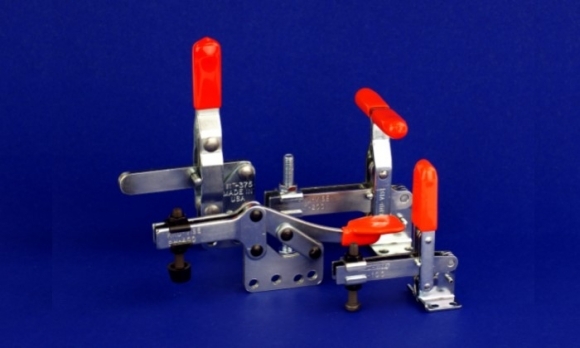 The Hold-Down action is the most common type of toggle clamp. They are available with handle that are either vertical or horizontal when the clamp is closed. They are used to apply a downward clamping force. 400 lb. capacity Horizontal Hold Down Clamp. Flanged Base. Open Toggle Bar. 400 lb. capacity Horizontal Hold Down Clamp. Flanged Base. Open Toggle Bar. Stainless Steel. 400 lb. capacity Horizontal Hold Down Clamp. Flanged Base. Slotted Toggle Bar. 50 lb. capacity horizontal hold down clamp. Flanged Base. Slotted Toggle Bar. 600 lb. capacity Horizontal Hold Down Clamp. Flanged Base. Open Toggle Bar. 600 lb. capacity Horizontal Hold Down Clamp. Flanged Base. Slotted Toggle Bar.